Manufactured in the United States using space-grade materials, GloShield is compatible with existing light cables adding an extra layer of patient safety without the need for intensive staff training or purchase of new capital equipment. While working together in the Wallace H. Coulter Department of Biomedical Engineering (BME) at Georgia Tech, co-Founders James K. Rains and Kamil Makhnejia spoke with hundreds of nurses and doctors who confirmed the fire risk associated with current operating room equipment was a significant problem. To them, the solution was apparent – a safety shield to contain the heat. Once they conceptualized a solution, Rains and Makhnejia utilized the resources available to them through the BME department at Georgia Tech to design GloShield and initiate the patenting process. 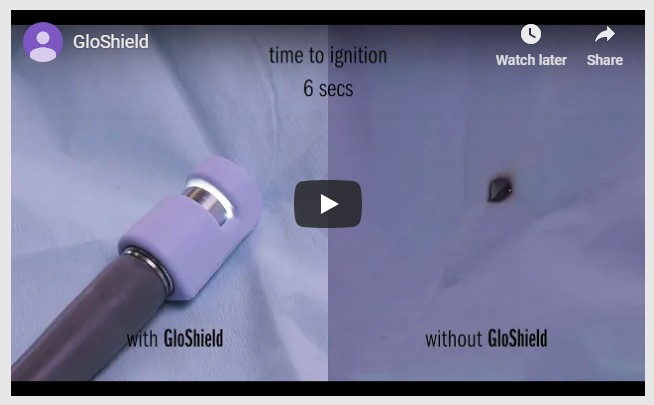 GloShield™ is a patent-pending fiber-optic light cable shield designed to reduce the risk of operating room fires. To learn more about how GloShield addresses patient safety, please visit the GloShield website at http://www.gloshield.com.